Originally an inhabitant of the Mediterranean countries, this perennial herb has long been recognized for its exotic perfume and medicinal properties. Used in past by the ancient Romans for its healing and antiseptic qualities, the name itself comes from the Latin “lavare” or “to wash”. Tibetans still make an edible Lavender butter to use as part of a traditional treatment for nervous disorders. Old English Lavender, a popular inhabitant of a cottage garden, can grow up to two to three feet high, producing fragrant grayish leaves and Blue/purple flowers. The more compact variety Hidcote, has darker Blue flowers, grows to around a foot high and is very pretty in any flower or herb garden. The easiest way to propagate Lavender is to cut softwood cuttings in the spring. However, as Lavender benefits from a light pruning in early autumn, these clippings make excellent new plants too, as long as you protect them from frosts and winter bite. Insomnia: Essential oil of Lavender has a calming effect which can be helpful in treating Insomnia. 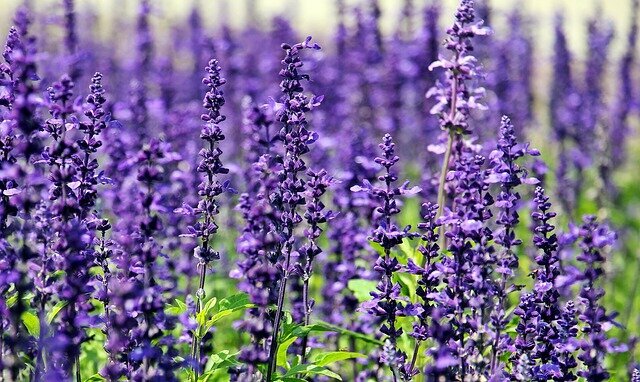 Inhaling Lavender oil may be as effective as using a prescription tranquilizer, according to one study. It is also effective when applied topically to help relax muscles. Postpartum: Lavender oil can help to ease perinea discomfort after Childbirth. It can be applied as a massage oil, or used in a bath. fungal infections such as Candidiasis or ringworm. Caution: Do not drink oil of Lavender. Recommended Dosage for the ailments above: One cup of tea twice daily, or oil applied as needed.